The ERHEM Company established in 1992, is a manufacturer of first class medical supplies and electromechanical appliances. The company, has its headquarters in Dębica at Puszkina 6 (Podkarpackie voivodeship), and mainly conducts its business in Poland. Initially the company based its production on its electromechanical department. The years of operation, experience acquired biomechanics, material technology, and consideration given to market needs, resulted in the expansion of the company’s operations with its medical department. Our mission and primary goal have been the ideas, which guide our development: QUALITY, COMPLEXITY, AVAILABILITY, and POPULARITY. These motivate our entire Erhem team to constantly improve our sales and manufacture in order to produce high-quality merchandise that reflects the needs and increasing demands of the modern customer. Our care for customer safety and satisfaction has been confirmed by the positive reviews from the Pathomorphology Department of the Nofer Institute of Occupational Medicine, where our company submits its products for meticulous toxicity tests, in order to exclude any possible allergic actions or topical irritation. Erhem concentrates on manufacture, so its technical base allows us to develop custom projects, designed to meet the individual needs of our customers. 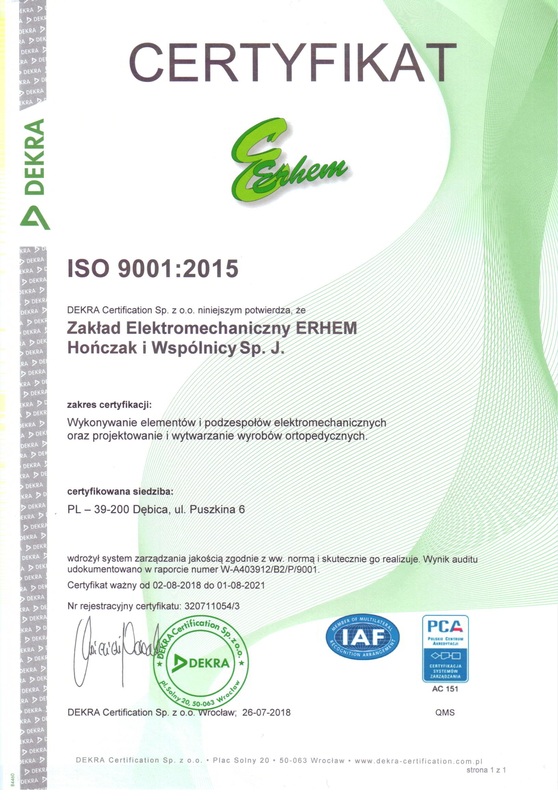 In recognition of the quality our products provide, Erhem received the ISO 9001:2000 certificate in 2000. This assures our clients that our products meet the highest quality standards. Our company is registered in the Polish First Class Medical Supplies Manufacturer Record as PL/CA01 03657/W.